This app is for you who do sports, go to the gym, workout at home, run, powerwalk, spend hours by the computer or just want to do well thought-out stretching. All exercises in the app is described by photos and written instructions and has alternatives for very limited flexible people. You get easy, classic stretching exercises for mobility training, and some exercises inspired by yoga or pilates. 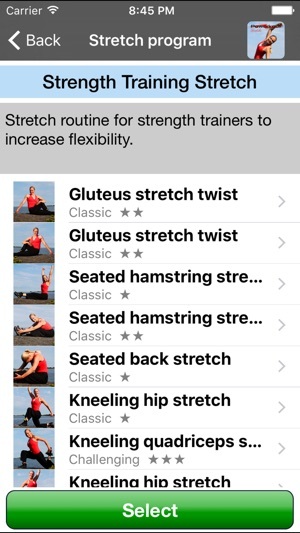 Poworkout Stretch contains 60 stretch routines! Start at any age - it is possible to make a difference at all ages. You can get more flexible by stretching. + More intense programs to use over time. + Daily stretch routines such as the office stretch, hair dresser stretch, store worker stretch. + Stretch programs for your sport - golf, football, running, walking, dance, strength training, tennis, hockey, riding, cycling, swimming, skating, skiing, floor ball, laser sailing. Stretching is when you carefully stretch a muscle until it is slightly tense and hold it there for 10-30 seconds. In the meantime - breathe deep breaths and relax. By stretching regularly you can develop an even flexibility, that makes the general risk of injury less. Stretching also increase your mindfulness and ability to relax. Your flexibility is also affected by the temperature in the room and the amount of warmup. 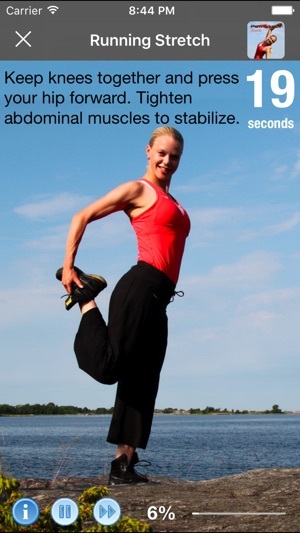 Always warm up with physical activity before stretching. – Lower back pain? Can be due to inflexibility in your hip muscles which affects the curve of the back. Very common issue but actually pretty easy to fix by stretching the hips. – Feeling flabby? Do some stretches to improve your posture. – Are the shoulders slightly forward? That is probably due to short muscles in chest area. – Sedentary job anyone? Stretch the office stretch programs and maintain or improve your flexibility. – Do you spend hours by the computer? Avoid neck pains by stretching. – Are you aging? That decrease your flexibility - but you can do something about it, it is not too late. – Are you stiff in general? Stretching improves your flexibility. - Hold a stretch 10-30 seconds, the longer you hold it, the more all muscles around the stretching muscle relax and that makes it all more effective. - Short of stretching time? Focus on the larger muscle groups and the ones that tend to be short such as breast and shoulder muscles. - Change your starting side from time to time. Start stretching left leg one day and start out with the right one another day - but always stretch both sides the same amount of time. Flexibility comes gradual eventually by stretching regularly. Stretching is supposed to be pleasant, not painful, do not try to force the muscle to be longer. Do not stretch if you feel pain in muscles or joint capsules - get yourself properly checked by a professional immediately. There are several ways to stretch the same muscle, variation makes all training more fun, even stretching. Find your favorites in Poworkout Stretch. Check out our workout challenges at facebook.com/poworkout and twitter @poworkout and get fit and fun! NOTE! Please contact us here: http://www.poworkout.com/feedback if you have any questions or experience any problem. There is no way for us to get back to you if you write your issue in a review. We will help to solve any technical issues. We would also love to hear you feedback, and we will be grateful if you wanna be a part of making Poworkout even better. Many thanks in advance! It's expensive for what it is. I'm looking for an all over daily stretch routine, and I feel like I could have just found a website with pictures to tell me what this app told me. I was looking for something more beginner friendly. It doesn't tell me what 'basic position' is, or how long to hold a stretch. If it says that somewhere I couldn't find it. Videos or someone speaking to you would be nice, so you don't keep your eyes glued to the screen while holding your balance. She has lots of stretches and routines for various parts of the body, various sports and activities. Great countdown timer so I get a good stretch....can even vary the amount of time for the stretches in a routine. I run and the run routine is a great cooldown.